PaintUnion are delighted to welcome Kate Hawkins and Sarah Kate Wilson to discuss their practices at the Griffin Gallery. Sarah Kate Wilson aims to destabilise the tradition of painting, of which a static object hung on a wall is typical. She sidesteps away from ‘finished’ paintings preferring to keep the works in a state of flux and make the passing of time explicit through various strategies, such as asking the audience to physically interact with the work and the use of ephemeral materials such as balloons and mirrored acrylics. Wilson is currently showing in a three person exhibition at The Newlyn Gallery, Penzance and has been nominated for the inaugural ‘2014 New City Prize for the Visual Arts’ in partnership with MK Gallery. Previous exhibitions include, TORTOISE, WW Gallery, London; PART THREE: Oblique Exchange, 2013, APT Gallery, London, UK; Uncle Vern’s Dog, Gallery North, Newcastle, 2013; Jerwood Drawing Prize 2012, shortlisted (UK touring show). She is currently doing a Practice Based PhD at Leeds University (AHRC funded). Kate Hawkins recently completed a practice-based PhD at Winchester School of Art on whether painting can be performative without becoming theatrical and what this means for spectatorship. Her work is informed by her previous performance-based background, frequently encouraging the spectator to adopt the role of performer and to actively engage with the work. In 2013/14 she exhibited in New Order II, British Art Today at the Saatchi Gallery, and in Bloomberg New Contemporaries, selected by Chantal Joffe, Ryan Gander, and Nathaniel Mellors. Recent solo and two-person exhibitions include Escape the Esplanade, Limbo, Margate, 2013; The King of Hearts Has No Moustache, Gallery Vela, London, 2012; and My Brother is a Hairy Man, with James Ferris, at George Polke, London, 2011. The context of the expanded field of painting brings immediate awareness to the use of other media, which may or may not include the classic associations of traditional painting mediums to operate in the debate about contemporary painting. Yes, both Sean Penlington and Cornelia Baltes work in the expanded field of painting, but what was striking about both of these artists was their relationship to humour, notably irony. Why should humour, mockery and irony be important in the nature of the way in which we communicate, not just through painting: during the course of daily life. André Breton, the surrealist in 1935 wrote a book ‘Anthologie de l’Humour Noir’ and coined the term black humour for the wit of the skeptic and cynic, often portrayed through satire, there are numerous examples of this in the fine arts ranging from Hogarth to Shrigley. And although neither of the aforementioned artists could be associated with surrealism, the notion of humour dates back to Roman times and is a common element of our sphere of communication today. Penlington using various languages, makes marks, creates angles and lines, holds onto drips, splats and gestures in trying to find a different space for painting to operate in. Recognising that all this mark making, maps out various psychological states, causing a to-ing and fro-ing, a flow, a loop of difference, if you will, not only within the paintings gestalt but, between the works installed and thrice again in the viewers glace. Humans are creatures of ever changing sensations, an impermanent flux of synaptic occurrences that only ever exist in one particular moment, in one particular time, never to be repeated. Looking at these paintings therefore brings awareness to these constantly changing states, making one aware of ones own being. The surface of the painting seems to be an honest history of the evidence of happenings, which is reflected paradoxically through abstract painting: a history of itself. This surface of evidenced is conjoined with other materials ranging from beads, paper, charcoal, rope, wood to be subsumed into surfaces that extend the boundary of the painting, creating a vocabulary of anticipation. Such humour juxtaposes the enormous weight of existence with comical elements that underscore the futility of life. In Penlington’s work we can literally see the weight of life leaning on the objects that constitute the painting. We can reference David Ryan here in the introduction to Talking Painting, 2002,where he describes the ‘present condition of abstract painting; fragmented, multiple, heterogeneous.’Penlington recognizes that abstract painting has an inevitable complex condition. It needs to be within a system, yet outside of those boundaries too. It is trapped in its own historicity that has a defined framework, albeit dynamic and in fact at times craves to be viewed without this baggage. Baltes on the other hand is working in a multitude of media from paint, photography, site-specific installations, print and objects, her creative talent lies initially in observation of the world around her. Working with sharp shapes, humourous configurations alluding to creatures and beings with a light but purposeful touch that has an inkling of Charles M. Schulz’s; Charlie Brown, Woodstock and Snoopy in the Peanuts comic strips. Every mark is coolly calculated, not to mention her true affinity for colour that sets a playful scene. Baltes’ beauty of observation in juxtaposing occurrences together speaks of many metaphors, but she is not prescriptive in the meaning, leaving the viewer hopefully with a wry smile. 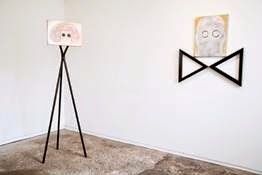 Simple anthropomorphic marks have weight to them; acting in an installation not only as individual pieces but have meaning in relation other objects and marks. The touch of the artists hand is evident, the physicality of the marks, be they painted or drawn, positioned fabrics, paper, chains, objects; they all have clear evidence of a willingness to handle materials and a keen ability in the balance and composition of space within the installation of the objects themselves and in relation to one another. What we mean by the expanded field of painting here is the nature of objects, from a painterly background that are installed in a site specific environment, where, objects, light, distance and spaces – all inhabitants of the environment are defined in relation to all the other things. Nothing therefore in an environment in the expanded field of painting therefore means anything really, except in relationship.For both artists work it seems that the connections themselves are real. 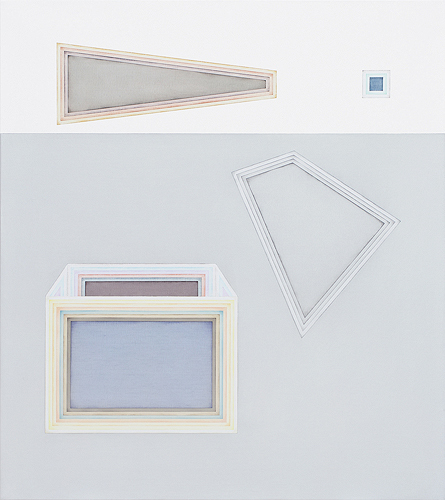 Using the spatial qualities of painting, both Baltes and Penlington transcend the confines of the picture frame with affability and humour. The intellectual use of space, using void as disruption; where space is interrupted with objects, touching on notions of difference, of connectivity, relation and interruption – constructs a singularity, yet the potentiality for further derivatives. Things being next to one another are related through proximity, not narrative. It’s the viewer who potentially brings the narrative. The metaphoric links therefore that do occur perhaps are not necessarily planned but a happy coincidence of observation by the artists. This flow of metaphors and juxtapositions occurs all around us, all of the time, yet the artist brings attention, a link or series of links, which for any viewer maybe carried over into their powers of observation in the future, making links, that they couldn’t have made before; recognizing small nuances in life due to a new neural path way being developed, or not. Both artists work with an openness that allows for speculation. A paintings meaning therefore is whatever the viewer attributes to it- this is one dynamic aspect of the expanded field. So as you can see, when we refer to the artists joke here, we are not referring to the slapstick, one liners of Richard Prince for example, but a sensitive, darker humour, rooted in a culture of stoicism, because humour in fact, might just be considered a mere coping mechanism. A way to look at the wider world with an affection that it sometimes lacks, so when considering the profundity of the everyday we find comfort in the fact at least someone else, including Baltes and Penlington, are in the ironic boat with us. It’s a very serious joke!This is the stuff that makes the world go round and it’s happening in the field of expanded painting. PaintUnion welcomes artists Susan Sluglett and George Little for our first evening of discussion. The term Painter of Modern Life applies to each artist, Sluglett presenting her painterly investigations based in an arbitrary mythology and Little adopting the metaphorical platform of the restaurant. Susan and George will each give a brief presentation of their work and then we will have a conversation with the artists, with a focus on how the history of painting is embedded in their practices. Susan Sluglett currently lives and works in London; she is one of the three Jerwood Painting Fellows 2013. Following the opening show at Jerwood Visual Arts in April, the exhibition toured to BayArt in Cardiff through August, and will open in Aberystwyth Arts Centre in January 2014. George Little currently lives and works in London. In 2012 he graduated from the Royal College of Art. He has exhibited widely both in the UK and internationally, including the Liverpool Biennial and the ICA as part of Bloomberg New Contemporaries. For Baudelaire, beauty is always in flux and momentary, yet enduring and eternal. ‘The pleasure which we derive from the representation of the present is due not only to the beauty with which it can be invested, but also to its essential quality of being present’and because we are made up of components analogous to what constitutes being man, there occurs a duality. The modern or ‘contemporary’ artist is considered the dandy, ‘a worldly observer with the curiosity of a child’ and ‘beauty is nothing else but a promise of happiness’. This brings a slant on the investigative title of the talk: the painter of modern, or should it be said contemporary life. If we consider this the starting point in framing the work of George Little and Susan Sluggettwe are immediately immersed in a commentary upon these notions of beauty, flâneurism and a thoughtful, yet possible grotesque analysis of the indulgence of the western world. George Little uses a variety of otherwise mundane subject matter orientated around the detritus of the restaurant to create a structured, yet opportune series of paintings. Aspects of pure painterly occurrence, such as metaphoric stains left on a tablecloth or the smear of lipstick on a napkin wrestle with bold lines and predictable patterns as though tussling with one another for dominance of the viewer’s attention. Layer upon layer of evidence is left, like the crumbs on plate. Underlying all of George Little’s work is a reflection on a fundamental need to eat and drink, this eating and drinking however comes with a commentary on what is left, the discarded bits of that beautiful plate of food, that experience of eating.More recently Little’s paintings have rolled into an installation format full of gestural mimicry. The palette and pattern are reminiscent of Henri Matisse’s use of colour or Patrick Caulfield’s bolshy prints. Likening the art world to the world of service. A cord between an expressive gesture and a formalized pattern is held in tension. Susan Sluggett’s gestural still life paintings have a strangeness about them that seems to be a different way of at looking at things, and when we look at those things they get translated though painting into quirky animated objects that appear to be up to no good. Referencing demise and excess amongst other things they cynically critique our everyday existence in the world. Obsession with the rich and famous, evidence of their demise on one level serves as a commentary of social awareness, like a Hogarth etching and on another level acts around this notion of flânuerism for the everyday individual to find solace in the fact that celebrities, and even morphed animated objects have their vices. There is a strange juxtaposition, like finding a champagne bottle resting on the wall of a housing estate in Hackney or the blow up doll left at the gateway to a church. The humour and irony cannot be missed, even though it is shrouded in a cartoon façade, deep morals actually lie within as Susan Sluggett pours questions over social power and human relationships with a light-hearted well attuned flick of the paint brush. Going back to Baudelaire’s observation that there is beauty in the every day and that anyone and everyone may cast themselves as the dandy. PaintUnion is pleased to welcome SeanPenlington and Cornelia Baltes to speak at our next discussion evening. Penlington and Baltes will be giving a talk about their recent work within the context of the expanded field of painting. Penlington’s work is predominantly concerned with the history of painting and how it affects and informs practise today. He focuses on history within painting as part of a vocabulary or tool which can be called upon to help develop the language’s future. Using a traditional Carnivaleque idea of structure, reference and mockery as a framework, Penlington creates visual jokes based on perception within his work. Notable exhibitions include The Jealous Graduates Edition and Print Gallery, The Saatchi Gallery, London, UK (2014), New Sensations (2010), The Threadneedle Prize (2011) and Creative Cities Collection (2012) now on permanent display in Beijing. His work can also be found at http://www.seanpenlington.com. Notable recent exhibitions include solo shows ‘Schnick Schnack Schnuck,’ Limoncello, London (2013), ‘There’s a light and a whistle for attracting attention,’ DREI, Cologne, DE (2013) and recent group shows include ‘Just What is Not Is Possible,’ Museum Folkwang, Essen (2013). Her work can also be found at http://www.corneliabaltes.com. A few things spring to mind where watercolour is considered and I am sure you might agree that the words amateur, nice, mediocre, outdated, formulaic and washed-out are a few of them, and possibly even domesticated. Watercolour isn’t proper art, it isn’t critical and isn’t contemporary. Wrong, wrong, wrong. On every count. A nice watercolour can be Sunday painteresque, but a competent watercolour is a completely different kettle of fish. Here we are talking watercolour that gets under the skin of watercolour. Used by contemporary painters, critically within their practice around the notion of ephemerality. Jemima Brown, a sculptor dealing with identity and social critique. Using her Facebook contact list to create a huge series of profile watercolour portraits made with watercolour pencils. Just like flicking through your face book contact list, the actual process of working in watercolour itself has to be a swift one. It’s momentary, as marks cannot be erased out unless caught in the act of dispersing when initially applied. The large groupings of these individual personas that are chosen by that Facebook contact; to represent themselves; to be their formal online identity, which they are essentially judged upon. Through this medium Jemina Brown cunningly not only questions her contacts need for a likeable image, or a real image at all, but also reflects on her own identity just as her sculptural work does with Dolly her doppelganger. Here our ideas about the authentic are challenged. Traditional portraiture, and then the photograph were used to capture a person, to capture their authenticity. The camera never lies is a myth and for these poor quality Facebook images to be used as source material which is then mediated for a third or fourth time is not actually an unusual way for any public to engage with images in the 21st Century. In fact it is probably more normal than going to see a series of small water-colours in the flesh, as it were. Small portraits of women’s friends would in the past have been completed in a domestic environment. These portraits are drawn as much as they are painted. Does watercolour reek of domesticity? Not knowingly in this context. Many male and female artists worked in this way, watercolour often being used as quick, experimental sketches, such as those used for architectural drawings or fashion illustrations rather than finished pieces. We can throw in the names Picasso, Kandinsky and Matisse, who all famously amongst others used watercolour to great effect. Using watercolour as the final medium could be considered almost brash, it’s a statement. The one off sketch, the throw away drawing being the finished article that depicts that portrait, as flippent as scrolling through your Facebook pages. What this collection of portraits do is to bring up the question of what is real, what we can trust and what an authentic portrait is today. Juliette Losq engages with watercolour through transient large-scale installations that depict derelict and demise. The question of aeon, of perhaps circular time, as it is only when things fall apart, that they in fact feel welded together. This is the nature of these transitory installations. That sublime experience has to be held onto by the viewer, as then it is only the reproduction through a photograph that once again creates a flat pictoral plane for future viewers to engage with. This momentary glace where we actually get to experience that torn paper edge, smell the antique wood, peer around the back of an installation and feel the tension between the proximity of large wasted volumes of watercolour, reflects the impermanence not only of the work installed, but of the scenes or the times depicted and further a reflection on our own mortality. To witness such an intricate scene, which has in fact been created using negative space, almost a construction in reverse, which appears finished because we can see how it began is a logic puzzle, a labyrinth for our eyes especially to feast upon. Watercolour is essential a series of stains, marks that are fleeting movements and momentary glances. Juliette Losq captures time in this way and uses it to great effect, with layer, upon layer of fine watercolour. Watercolour also has a history as a medium for landscapes. To name but a few: Constable, Turner and more recently Hockney. In 18th Century Britain, landscapes became an appropriate subject for painting, especially as the British started to consider a European tour as a normal aspect of either education or exploration. Watercolour portraits of places made by those who had travelled became a rite of passage and have a flavour of the notion, when we view them today of the aged old British Empire and the associations of sovereignty and perhaps faded splendor and cynicism that only the British seem to hold onto. The sad and derelict chaos of Juliette Losq’s subject matter, that shows those Turneresque landscapes reclaim the land in a dichotomy of space, which has dynamics of the habitable and the abandonment. So yes, yes, yes, to the contemporary use of water and colour combined. At the end of the day, we have here two artists daring to use such a medium and without the limitations of gendering such a choice as they have both firmly rooted it into their very different contemporary practices with a gusto, further challenging the boundaries of what watercolour can do and how it can critically do it. Whether you consider Art14 as a fresh new addition to the London art scene, or a way of absorbing a wall of funds flowing into London, it does offer the chance to see a host of galleries you may not previously have seen. Pushing into the hall through the overwhelming bling of the entrance, the highest concentration of finds for me were in the Emerge section of the show, with several of these galleries having also shown at London Art Fair in January, now bringing a new set of works to Art14. Fold Gallery’s painting-through-to sculpture show was particularly interesting, including a Kes Richardson work suggesting to me a fresher, lighter contemporary take on Peter Halley, and a row of Dominic Beattie’s glowing thin sculptural wall pieces. Nearby and beautifully positioned right in the centre of the hall, Edel Assanti were showing works by Gordon Cheung. Strange spatial effects produced using spray and print over pages from the FT, were overlaid with the thickest, shiney seductive strands of paint. My favourite included an image of an empty ghost town (presumably Ordos), the two horses standing in Genghis Khan Plaza taking centre stage, tribute now to a burst housing bubble. Elsewhere in the Emerge section Bearspace were showing Reginald S Aloyisius detailed charcoal landscape drawings with lumps of dried paint seeming to float on the surface, and opposite Hanmi Gallery drew in the eye with Junebum Park’s videos of people following an unknown set of rules to move around a grid like a surreal human game of chess. But it was outside of Emerge that I saw what were for me the two highlights of the show. Firstly Mummery & Schnelle’s simple photographs of folded black photographic film by Paul Caffell were elegant and minimal yet pulled the mind round in circles. Finally, very much worth seeking out at a gallery called Andipa, right towards the back of the hall a work by William Makrell drew me back several times. Consisting of a grid of what appeared to be carbon paper, the work was called ‘Sleep’, and appeared to show the marks left after the artist had slept on them. Conjuring up references to Emin’s bed, yet thin, slight and understated, the work was lit from behind giving an impression of a night sky. On first entering the hall, my initial impression was of the soaring space of Olympia left empty above the white flats of the gallery spaces below, which seemed a lost opportunity. Just one piece seemed to offer relief by linking the two, with Hanaa Malallam’s staircase ‘Barzakh: Obstacle’, a wooden staircase teathered to the roof by a metal cable. But even then the viewer was deliberately thwarted by missing steps and installation on a vertical plane offering a ‘perpetual, inescapable situation’. Towards evening Thursday’s opening became a crowded, shouty affair, but beyond the frenzy Art14 has some real gems that are worth seeking out. The Griffin Gallery will be showing 'Water + Colour', curated by Becca Pelly-Fry, in the gallery during this PaintUnion discussion night, so we thought it would be an excellent opportunity to discuss ephemerality and how artists use water based media in their practices now. I went to LAF14 looking out for contemporary painting in the expanded field and despite the natural predominance at Art Fairs for work that hangs on a wall or sits on a plinth limiting the opportunity for installation, I found plenty of work that seemed to shift subtly between modes of painting, photography and sculpture. Heading towards the Project Spaces as the most likely place to find this, I first paused at Fold Gallery to contemplate Kes Richardson’s disarmingly simple Garden Paintings. The artist begins with a geometric motif taken from formal gardens and subjects it to layers of erasure, repetition and concealment to, in my view, mesmerizing effect, the opacity of the paint and roller marks emphasizing the sense of the work as an object. Moving on, up the stairs to the mezzanine, a glowing Biggs/Collings work stopped me in my tracks and drew me into Vigo Gallery to see Marcus Harvey’s expressive painted ice berg triumphing over a photographed sea. Carrying on up the stairs again and to Orion Contemporary where Juliette Losq had translated the layering of her beautiful paper installations of lost spaces into smaller scale watercolour works yet still demonstrating her incredible detailed drawing. Into the Project Spaces, and Cathy Lomax’s sad actresses reflected in actual mirrors made me stop to gaze at the loose liquid handling of paint, but it was at Axisweb where I found my highlight of highlights with Clive A Brandon’s fragile watercolour and collage works. The artist reflects his experience of walking in remote places, describing his work as a kind of travelogue in which he experiments with the idea of what landscape painting might be whilst referring back to artists such as Paul Nash. The torn edges and hanging-off-the-wall installation of his work was interestingly juxtaposed with Virginia Verran’s layered spatial pigment pen drawings on canvas. On through to the main block of Project Spaces where I enjoyed Joey Holder’s sleek videos at Hanmi Gallery, Ben Bridge’s new abstract dark void paintings at Dalla Rosa, one of which, whilst being oval mirror shaped also spelled it out with the title ‘Mirror’ and Narbi Price’s ‘Untitled Shadow Painting’ at Vane. Pulling me further into the void, Maria Stenfors’ selection of Lilah Fowler’s elegant sculptural pieces provided a calm minimal space to stop, breathe and spend time with one of my favourite pieces of the day, a matt black crumpled sheet ‘Out of Content’ collapsing yet clinging onto the wall like a crashed stealth drone. Hannah Perry’s similarly crumpled, painterly sculptural work of layered metal sheeting with scraped paint at The Sunday Painter seemed to take a step back towards the real world, suggesting a battered scrapped car bonnet. At the bottom of the stairs to the Fellowes/Epstein duo’s precisely curated Photo50 (in which, as they point out most of the works are not made with a camera, suggesting an expanded field of photography) Seventeen Gallery were showing Saechin Kealey’s thickly gestural paintings, transformed by spray paint so that they seem flattened, hanging somewhere between the spaces of painting and digital imagery. All in all a day of shifting in and out of real and imagined spaces, lost in the world of the art fair. But before going, one of the few installation pieces in the show, Susan Collis’ ground sheet (also at Seventeen) got me yet again – letting me ignore it, and then forcing me to look and look again as the apparent stains reveal that they are actually delicate embroidery, a tiny hole in the wall in fact a black diamond. Time to take a final look at Limoncello’s sharp and subtly humorous show of Cornelia Baltes’ playful paintings, and out. Popped in to Tintype at the weekend to see Jost Munster ‘Together for Now’. Lovely show of small works plus two installation pieces (my favourite works in the show - don't miss the one hanging behind the gallery desk). The gallery describes Munster’s foremost concern as the ‘how’ of making work, how to create the illusion of space, how much or how little is needed to sustain the space that frames a work, in my view seen to best advantage in the delicate installation of bamboo bandaged with strips of old paintings. 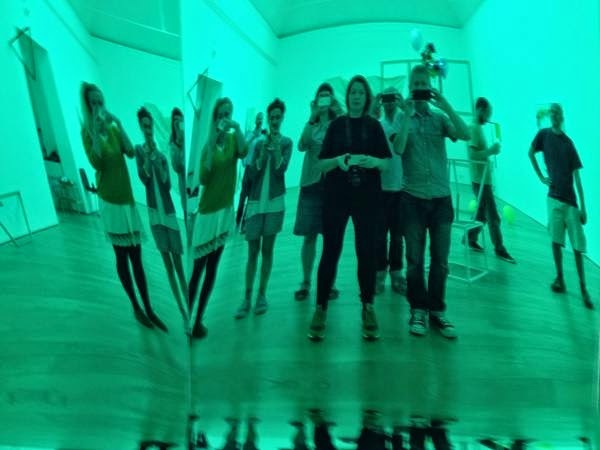 Kicking myself that I missed the group show ‘Limber – Spatial Painting Practices’ that the artist co-curated (with Cherry Smyth) last year in Canterbury and Rouen. Tintype recently moved from Clerkenwell to Essex Road, not far from Islington Green, so anyone going to the London Art Fair this week take the opportunity to see this show - its only a couple of minutes walk away (Tintype open Wed-Sat).